Chris and I had the most amazing grilled steak tips ever the other day prepared by our friends Meghan and Tom. After one delicious bite I was hooked, and proceeded to rave about them for the rest of the evening. Thankfully they were kind enough to share the recipe for the marinade. 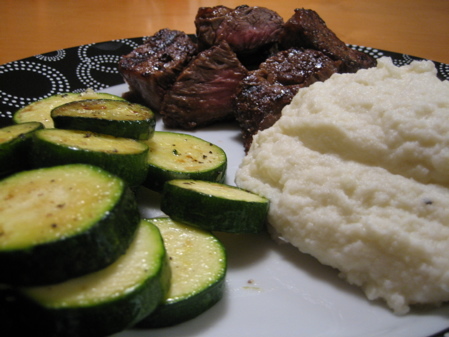 These fabulous steak tips are so delicious due to an eclectic combination of Coca-Cola (what?! ), BBQ sauce, Italian dressing, Teriyaki, and olive oil. Apparently Coca-Cola is used pretty commonly as a meat tenderizer. I had no idea! I would recommend marinading your tips overnight in this mixture. In addition, they’ll taste so much better if you have access to an honest to goodness outdoor grill. Since I prepared mine on a grill pan I really missed the addition of the smoky flavor. Unfortunately gas grills are persona non grada in our apartment complex so a girl has to do what a girl has to do. I served my tips with zucchini and whipped cauliflower. Another soft drink use: Dr. Pepper for fajita marinade. De-lish. Don’t judge a book by it’s cover! Well i am definetly trying this one!! 🙂 Everything you make looks delicious. how much salt and pepper do you use? I can tell u where this recipe was born: Newbridge Cafe in Chelsea Ma. The BID difference is to ALWAYS! Use CHERRY coke/Pepsi. Josh is right, this is an original creation I heard from boston, chelsea is the closest city north……thanks for the advise, I will try cherry coke next time….. The New Bridge Cafe in Chelsea, Massachusetts is famous for their steak tips. This recipe was given to me by someone who had a relative that worked there. A lot of people think there is ketchup in the marinade, but it is actually chili sauce. 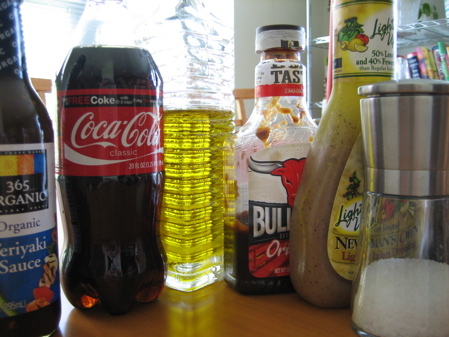 The marinade ingredients must be in equal parts, and you must use regular Coca-Cola, not diet. The sugar in the soda helps tenderize the meat, and also adds flavor. 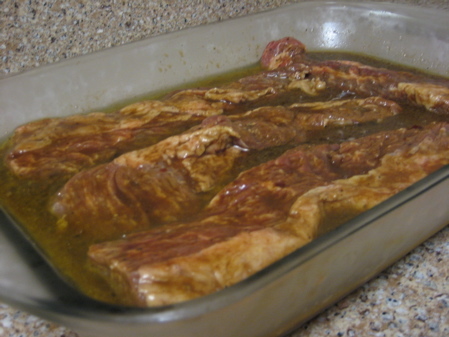 Mix all marinade ingredients and place in a large zip lock bag with steak tips. Place in refrigerator and marinate for 8 hours or overnight. 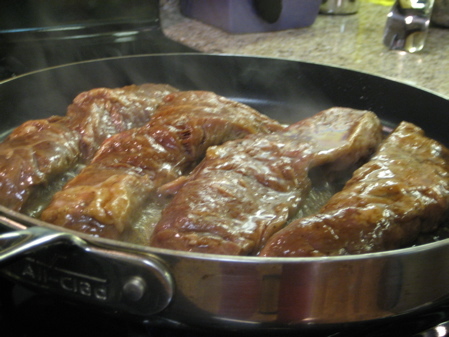 Take meat out off the refrigerator at least an hour before cooking, to reach room temperature. Grill, broil or bake to desired doneness.